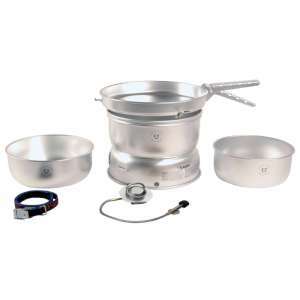 The Trangia 27-1 UL Stove is a lightweight and compact cook system made from ultralight aluminium that is ideal for a one to two people when backpacking and camping. This Trangia set is made from an ultralight aluminium to ensure that the weight is kept to a minimum while being scratch resistant and efficient to offer you an excellent cook system for your next adventure. 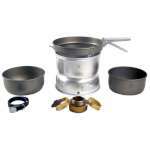 This set contains the Trangia gas burner, which provides more heat than a conventional meth burner, a lower and upper windshield to protect the burner from wind and ensure it is well ventilated for the heat to be directed upwards to the pan, two 1 litre pans with one lid that doubles up as a frying pan and a removable handle, all the equipment you need to cook up an excellent meal in the great outdoors. The whole of this Trangia 27 series cook set fits nicely into the windshield and the strap provided will hold it all together so that it will take as little pack space as possible. The original Trangia system has been a favourite for generations thanks to its simple and effective design, it is also part of the Duke Of Edinburgh recommended kit list, and this 27-1 UL Stove System is a great way to take a lightweight stove with you on your next adventure.